Today, Tim Cook made his first major apology as the CEO of Apple. It probably won't be his last. Despite the obvious knee-jerk reaction regarding the Maps debacle, it's actually interesting that this particular scenario is yet another example of humans having extraordinarily short-term memories. It's the same reason that whatever game we most recently saw is the "best or worst ever." (Packers v. Seahawks 09.24.2012, I'm looking at you.) In truth, Apple has a fairly solid history of ingesting pride in the iPhone era, when it surged headfirst into the realm of serving consumers in a way that it never had before. And moreover, hearing Cook apologize isn't something that should be mocked or berated; one can only hope that more companies of all shapes and sizes develop a policy of listening and reacting. Allow me to explain. "The new iMac has been a huge hit and we are working hard to fulfill orders as quickly as possible. We apologize for any inconvenience or delay this may cause our customers." While we're reliving the noughties, it's worth recalling that bungled .Mac to MobileMe transition, where Apple's MobileMe team publicly admitted that the switch was "a lot rockier than they had hoped," while "apologizing to [its] loyal customers and expressing [its] appreciation for their patience with a 30-day extension to MobileMe accounts free of charge." "We apologize for disappointing some of you, and we are doing our best to live up to your high expectations of Apple." "We've recently heard from many loyal Apple customers who were disappointed to learn that we had removed our products from the EPEAT rating system. I recognize that this was a mistake. Starting today, all eligible Apple products are back on EPEAT." 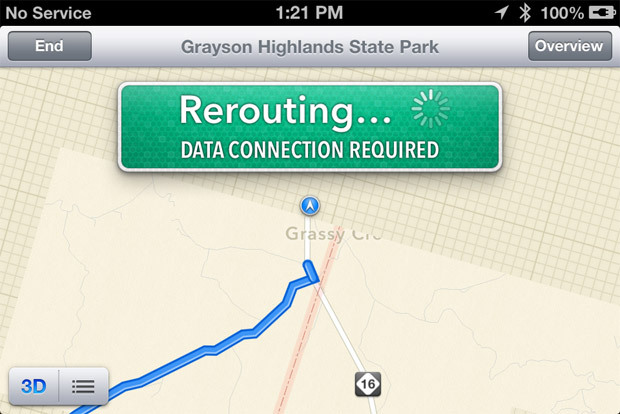 The point here isn't to apologize for Apple; I can say firsthand that the Maps in iOS 6 are inferior to the ones we're leaving behind, and need a lot of work in the near future. It's to prove that Apple actually has something of a track record for saying that it's sorry, and in the case of Maps, going so far as to recommend its chief rivals (Google and Nokia) by name as stop-gap alternatives. But beyond all that -- well beyond Apple -- is the greater point. It actually links directly back to a piece I wrote earlier in the week regarding the slow and spectacular death of customer service. We live in a world where it's now a surprise to hear of a company listening to its users, issuing an apology and vowing to make it better. We live in a world where it's now a surprise to hear of a company listening to its users, issuing an apology and vowing to make it better. There is something fundamentally wrong with that premise. Indeed, those very acts should be celebrated by all in the industry, even those who wish ill on Apple. What's the alternative? Wishing that monoliths like Apple would just bury their heads in the sand while doing nothing to improve the state of their products? If anything, I can only hope that the Maps apology ignites an industry-wide trend where even more apologies are issued -- heaven knows I see enough kit roll through our offices that could use one. As consumers, it's on us to remember these apologies and hold people like Tim Cook to his promise of making things better. And eventually, to vote with our wallets if said promises aren't kept.